This page contains some details of games and machines which do not fit into any of the other categories. It was a game where the player tried to project a coin into a catching cup. 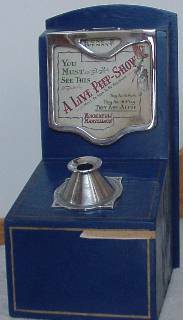 Similar games do exist, such as The Smithy where a coin was projected into a receptacle and returned to the player if successful. Bryan's game had two coin slots, one for a penny and one for a halfpenny. So right from the very beginning Bryan was offering something extra. Inserting a penny gave a 'better' game. Exactly how it was better I don't know, perhaps an additional element was involved to make it more interesting, or perhaps it was easier to win with a penny? The main problem with the Odd Clod was that a skilled player could always win! Bryan learnt valuable lessons from the Odd Clod, the main one being that games have to be much more difficult to play than they look! 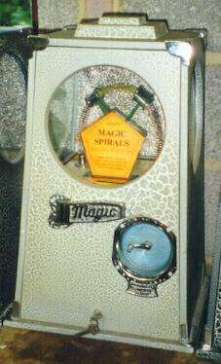 The empty glass jar is covered by a metal sleeve, and then swings over to the right to cover the disc (which can't be seen clearly in the photo). When the metal sleeve is raised the disc has disappeared. The sleeve then lowers again and when the jar is lifted the disc has returned. The length of string is pulled from side-to-side through two cylinders. A blade then descends between the cylinders, which draw apart to show that the string has been cut. The cylinders then rub together to 'mend' the string, which is then pulled from side-to-side again to show that it has been restored. Also known as the DYE WORKS. 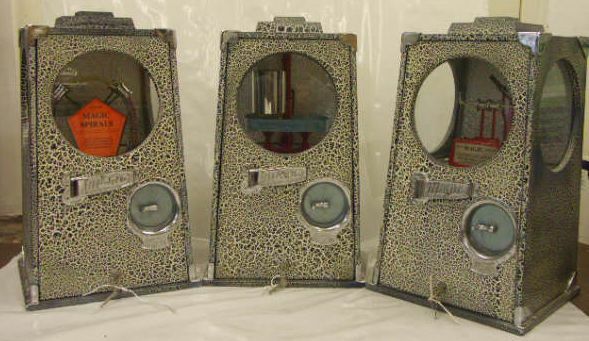 Bryans only made a single prototype of this viewer in 1948, and the machine never found its way into the penny arcades. 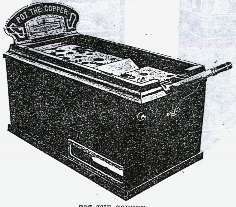 After William Bryan's death the factory produced a few of these machines for collectors only. The effect produced is of a colour-changing optical illusion. As the wire passes through the 2 collars, it appears to change colour. 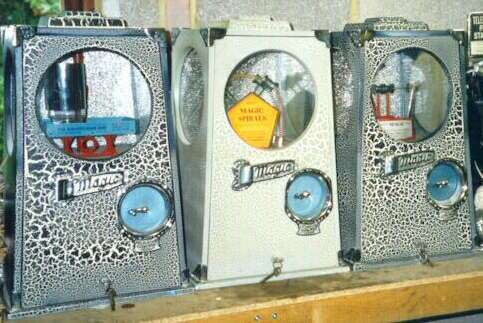 These are the last three Magic Machines to leave the Bryans factory, before it burnt down in 2000. 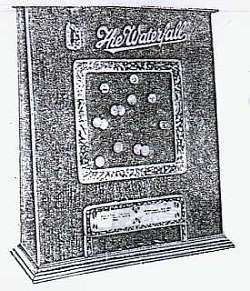 The constant stream of coins tumbling down the playfield of this machine resembled a waterfall - hence the name. 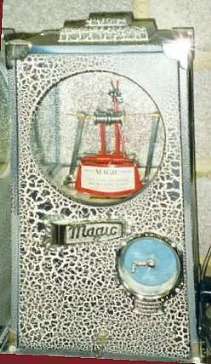 The mechanism was driven by an electric motor, and the object of the game was to insert a penny into the slot, which opened a shutter over which the falling coins were passing. 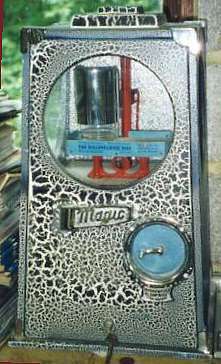 The idea was to time the opening of the shutter so that the maximum number of coins would be returned to the player. 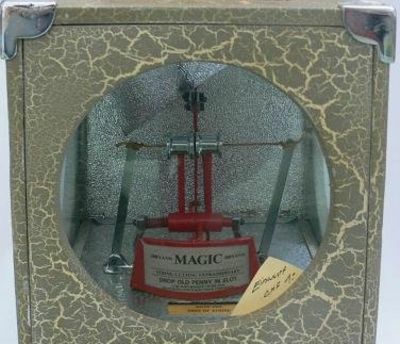 I have never seen one of these machines, but it must have been a very attractive sight in an arcade, with all those pennies constantly tumbling down the playfield. 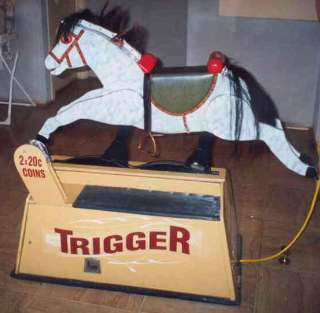 The Bumper was a coin-operated version of the popular fairground Striker. 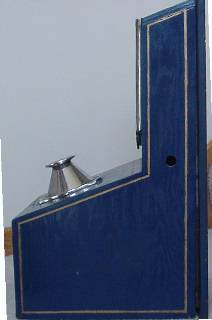 Play consisted of hitting the lever at the bottom of the machine, to drive a projectile upwards and along a vertical scale. The machine would pay out according to the position in which the indicator came to rest. Whereas the fairground Striker relied on brute force (and ignorance?) to drive the projectile as far as possible up the scale, with a 100lb lump hammer; the Bumper was designed so that skill was rewarded, rather than strength. The scale was 18 inches long, and had 28 winning positions: Eight 1s, twelve 2s, four 4s, three 8s, and a single 12 as a maximum prize. These numbers were distributed along the scale so that the player had to use skill to try and reach the required position. 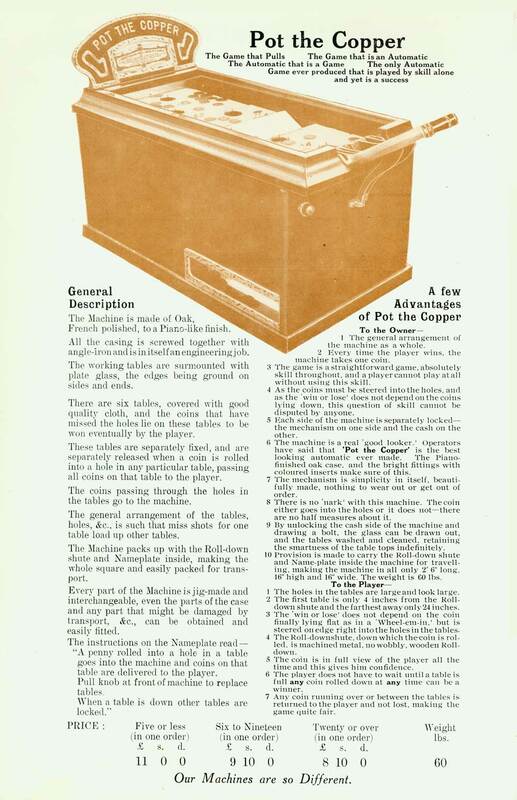 Only 12 Bumpers were made, the smallest production run of any Bryans machine. Until recently, at least one Bumper was thought to have survived, but this claim now looks increasingly unlikely. 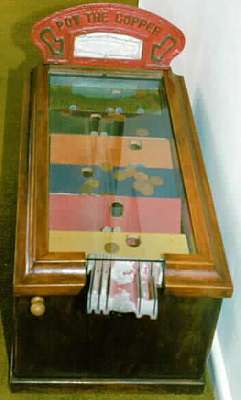 This is a coin rolling game, and consists of six pivoted tables with holes in them. 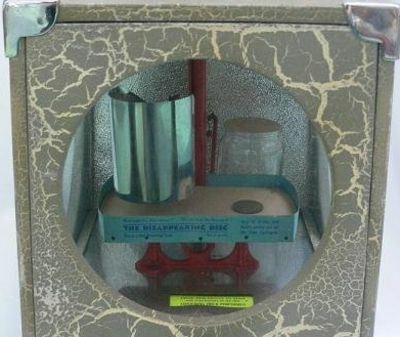 The object is to roll coins down the chute, so that they drop into the holes. Coins that have missed the holes lie on the tables to be won later. A coin dropping into a hole releases that table and all the coins on that table are returned to the player. The winning coin goes into the cash box. 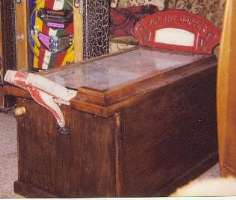 Tables are restored by pulling the knob on the front. The tables are interlocked so that only one can be released at a time, therefore the machine will not pay out any winnings unless all the tables are in the normal position. The nameplate at the back, and the coin chute are both removable and can be stored inside the case for transporting. 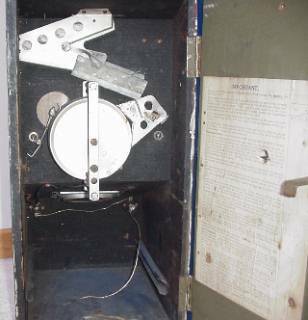 This strange device consisted of a small wall-mounted box with a viewing lens on the front. The backflash advertised in large letters: "NUDIST COLONY - They are at work. They are at play. They are alive!" What it didn't say was that the nudist colony consisted of a colony of naked ANTS!! 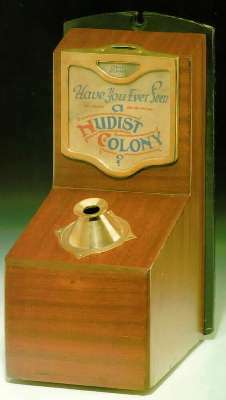 The player's coin operated a time switch, which activated a lamp and allowed the ants to be viewed for a preset length of time. 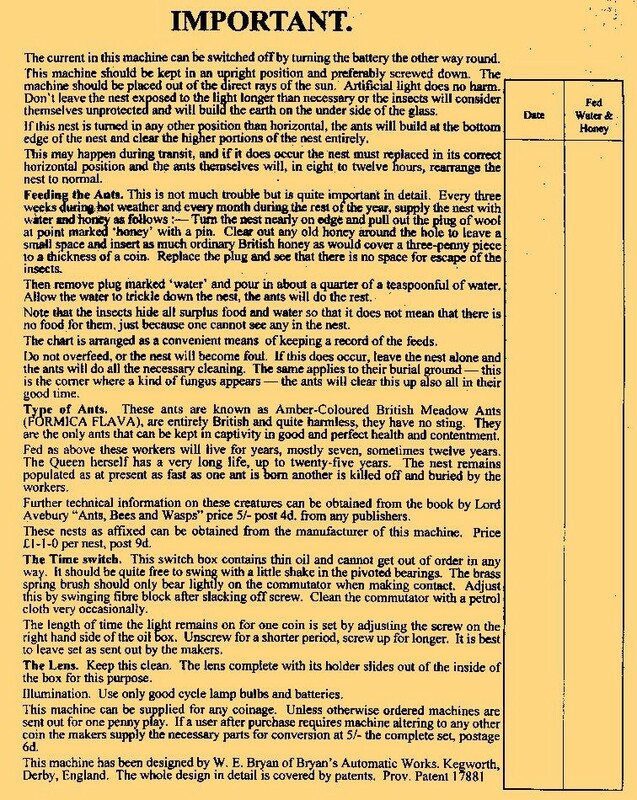 The instructions that came with the viewer advised that the machine should be kept in an upright position and preferably screwed down! I can't think why! The Nudist Colony appears to have suffered from an identity crisis. The photos here show the machine with four different backflashes. 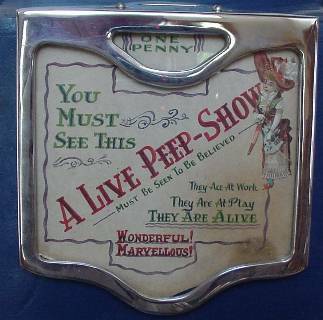 The device was later marketed as THE LIVE PEEP SHOW, probably because the word 'Nudist' was causing offence to those gentle folk of a more innocent age! The device is now commonly referred to by collectors simply as the ANT VIEWER, which is a pity, as Bryan's hilarious joke is lost in the process. The wordplay was essential, of course, to persuade a gullible and curious public to part with their money. It is doubtful whether the machine would have enjoyed much success if it had been labelled 'Ant Viewer'! 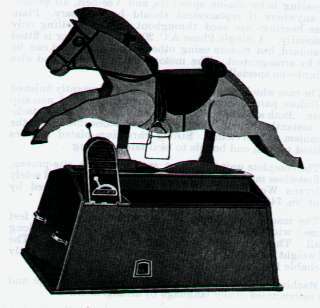 This coin-operated childrens' ride had three entirely separate forms of action to cater for children of all ages: 1) Simple Rocking Motion; 2) Galloping Action; 3) Hunting Action and Steeplechase. 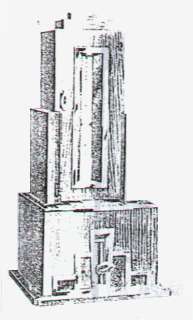 The motion was selected during the ride, by means of the lever at the front. Ride duration could be set by the operator to 45 seconds, 1 minute, or 2 minutes. 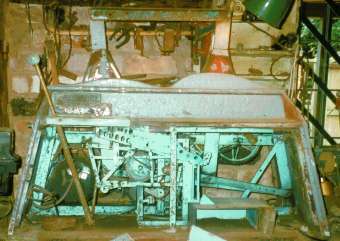 Right: This photograph from the Bryans museum shows the surprisingly complicated mechanism of the Kiddie Ride. The machine was too complicated and expensive to compete with the other rides on the market at that time and was not a huge success.